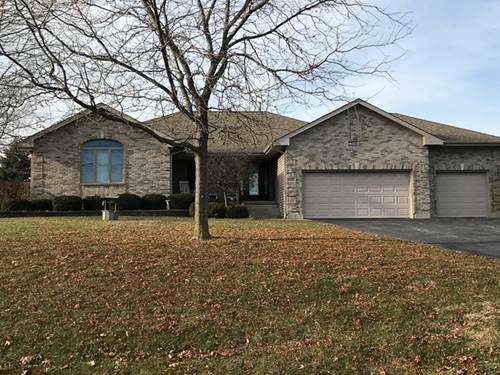 Custom ranch home in Johnsburg School District in move-in condition. One-acre + lot offers quiet and privacy, your end-of-the-day peaceful sanctuary. Open floor plan is great for busy families and for entertaining with ease. Kitchen features lots of work space and custom cabinets plus room for a breakfast table. Large, comfortable bedrooms and spacious, open living/dining room combo. Master bedroom features two walk-in closets and bath with separate shower and whirlpool tub. Handicapped accessible with two negotiable chair lifts (could be removed), one from garage into house and one from the main floor to the basement. Three-car garage. Very large fenced dog run in back yard. Low maintenance exterior. China cabinet in dining room stays. For more information about 5001 Country Springs, Johnsburg, IL 60051 contact Urban Real Estate.